Dragon Along - Shootsie...Individually Wrapped! Cloak your little adventurer in soft satin armor and make a fashion statement wherever you go by taking Dragon Along. 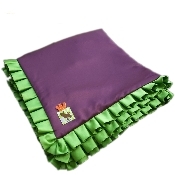 Inspired by the colorful crests of medieval knights, this royal blanket will tickle your tot's imagination. Pleated edge. Satin rayon/poly/poly-fill makes for snuggly comfort. Hypo allergenic fill. 36-in. x 36-in. Washable.